NBA Stars in Manila, Philippines- Kobe Bryant cuffed the basketball, and then eluded his defender with a show and go as he was driving toward the basket. And before anyone could blink, the ball ended up in the steady hands of reigning MVP Derrick Rose, who went hard with an emphatic two-handed slam. You won’t even see Bryant and Rose team up in an actual All-Star game, but the crammed up crowd in the newly renamed Smart Araneta Coliseum got to witness the once in a lifetime spectacle. Pitted against the PBA All-stars, the nine-man US select squad led by Bryant, Rose, Durant and Paul overwhelmed the star-struck locals, 131-105, Saturday night in the first of two exhibition games of the Smart Ultimate All-star Weekend. Bryant and company started slow but when their team do make a basket it was most likely to be far less than spectacular. From the second overall pick Derrick Williams to the back-to-back scoring champion Durant, each had his fair share of highlight reel plays whether it’s one of their dazzling crossovers or spellbinding slams. 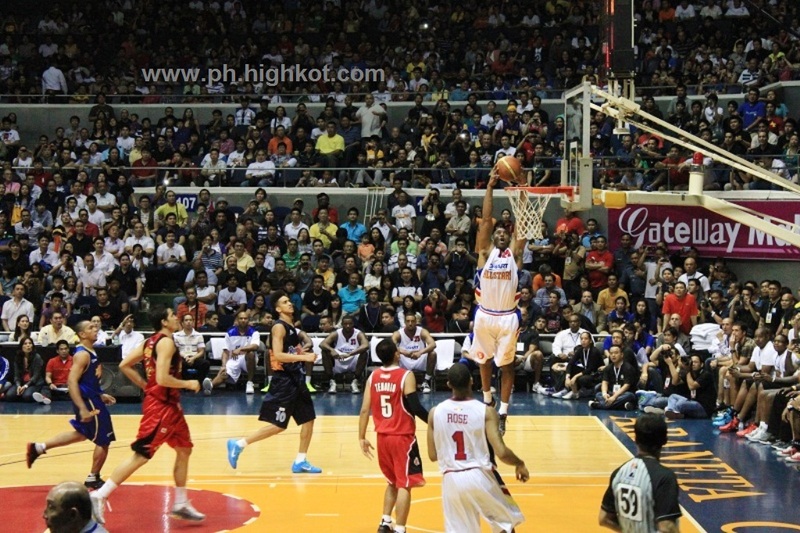 In fact, Durant wowed the crowd with his limitless range more than his above the rim antics. Durant unleashed 19 of his 22 points in the first half alone built around his array of offensive arsenals while Bryant, the showman that he is, did not disappoint either. The fan-favorite Bryant, who only played three quarters and finished 12 points, was in his usual game-form as he played with the crowd and toyed with his defenders—one of which is Petron Blaze’ Arwind Santos. 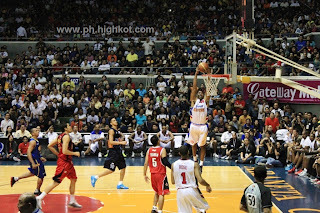 Santos, who paced the PBA side in scoring, took part in two of the game’s highlights—the other end of it though. After falling on his rear end against a crisscrossing Tyreke Evans, Santos got another crack to save his name. But facing the five-time champion Bryant? Forget it. Adding more insult, Bryant put Santos to school with a move only seen in the streets before backing him down for the patented Black Mamba turnaround. It wasn’t all about the US squad though as the PBA stars also showed off. Talk ‘N Text guard Jason Castro showed off his scrappy side when he pick-pocketed All-star playmaker Chris Paul twice. Seven-foot slam dunk artist Javale McGee led the NBA stars with 25 points. The star-studded NBA cast will parade their wares for the second time, and this time expecting tougher and a more serious side in the Smart Gilas Pilipinas.